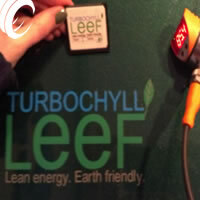 Welcome to TURBOCHYLL LeeF, the Aftermarket Industry's only... 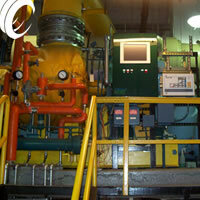 True Steam Turbo-Chiller Control System! 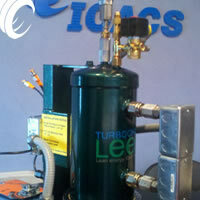 TURBOCHYLL LeeF is not just a "control panel", but a fully integrated system of compressor and turbine actuators, valves, and chiller purification devices. Each consideration intended to take full advantage of today's energy strategy for contemporary Steam Chiller performances and expectations. Through the TURBOCHYLL LeeF Computer Process Control (CPU) and Program Card Processor (PCP) we can afford critically engineered and predictable performance specifically for your Steam Turbine Chiller. No guesswork or "one off" programs here. The CPU by design maintains the TURBOCHYLL's proven "software program" which fits neatly on a front loaded 2GB Compact Flash Card. In addition to these uniquely powerful control strategies, each PID loop is accessible for local tuning, gain and fine resolution settings without complex laptop consideration, software licensing or special program. 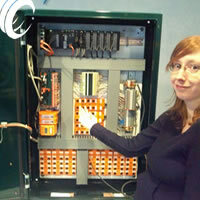 The TURBOCHYLL LeeF Control Cabinet is manufactured with the finest industrial "zero screw" components available and runs exclusively on safe Low Voltage 24VDC with less than 3amps consumption! Here you will find the brilliantly simply Swivel Docking Blocks, CPU and front loaded Program Card Processors as well as the Front Panel Mounted Graphic Controlled Color 15" Human Interface Display. The Field Mounted Sensors are critically immersed into the varying fluid streams and each maintains LED readouts of pressure and temperatures for convenient operator inspection. 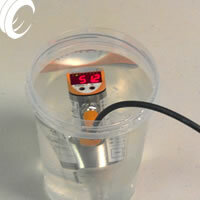 No longer is there the need for leaky old mechanical gauges. Final fit of The TURBOCHYLL LeeF system includes exclusive retrofitting of old, absent or antiquated step controllers with fine resolution analog actuators, motorized valves, compressor vanes controllers, governors and nozzle management. The TURBOCHYLL family of end devices offers field fit, carriages, distill tanks, linkages and the like for a perfect final fit of your Steam Turbo-Chiller Control System!